try `em on :). he`s even got his own slippers!. Wallpaper and background images in the Miles "Tails" Prower club tagged: tais.slippers.awesome cute. where did you get those? I want one! I didn`t get them i found it on GOOGLE IMAGEStm. 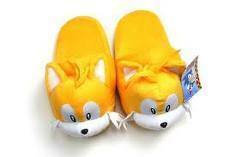 BUY OUR NEW TAILS SLIPPERS!!!! Bring his hugs with you!!! !